Earlier, my friend Elise linked me to this recipe for an Estonian Kringle she’s made before. It’s basically a giant cinnamon roll, but shaped more like a flower. On a whim, after dinner, I decided to whip one up. It is incredibly easy. I only use instant yeast these days, so the beginning proofing part of the recipe didn’t really apply to me. The dough came together really easily, though, and rose really fast, wow! By the time I finished doing all the dishes from dinner and mixing up the Kringle, it was 2/3 of the way to being doubled. It was maybe 30 minutes. :o It probably helped that the kitchen was pretty warm, too. I’ve struggled a lot with what I want to do with my digital space(s). I’ve had this domain since, oh, 1996? 1997? Something like that. So, it’s a part of me. The name “danakate” is a part of me, too, but identity is difficult and dynamic, you know? I don’t talk about work too much, mostly because I shouldn’t and it’s fundamentally boring. Also, military defense is sometimes controversial. The nutshell version is that I work on submarine software. So, if you follow me in other online spaces, that’s why I sometimes suddenly post things related to submarines. That, too, is now a part of my life since I’ve worked in that space for the past 15 years (has it already been that long?). Currently I’m more of a people handler. I didn’t think I’d want to be, but these days, I’d rather help design the software than write it. I suppose that’s why I’m “in charge” of junior engineers, now. I’m not a manager, but a tech lead/subject matter expert, and that’s exactly where I want to be…for now. Video games and I have an inconsistent relationship, so I probably won’t ramble about that too much. I like games a lot, I don’t play them nearly enough, but sometimes I do. I have way too many games in my Steam library that I’ll never play, mostly because I’d bought them as a bundle or they were gifted to me and I thought I’d play them but didn’t. Many I’ve played for just a few minutes. Others I will play for many hours, but never finish (Fallout 4 is the most recent of that line). I have a lot of games for PS/PS2/PS3/Xbox/N(3)DS that I’ll probably never get to, but I did my time with consoles a while ago (it’s a miracle I made it through the first 3 Gears of War games, to be honest, but I had a good group of friends to co-op with and co-op is awesome). These days, the one game I consistently keep up with, albeit very slowly, is Final Fantasy XIV. I’m currently making my way through the 3.0 main story quest line. Side note: It’s always amusing to me when my fandoms collide. I started my online life with a group of people who loved id software’s Quake games (I wasn’t around for the popularity of Doom). I found some fellow fans of The X-Files around the same time, which is where “danakate” comes from. At one point, multiplayer was in the works for Quake and the dev team needed testers to ensure the 32-player limit would hold up and I’d been part of that group. They took a screenshot of all of us in one of the rooms for some magazine or another (after which, of course someone ran to grab a quad and fragged all of us at once, who wouldn’t?) and a friend on The X-Files side of things contacted me and said he’d seen me mentioned in the magazine. Ha! So, what does that leave me with to blog about? Crafts! It’s sort of a broad category. I’d tried to do a baking blog before, cataloging the things I’ve done, but circumstances have changed (i.e. I moved across the country and work from home, so I can no longer take my baking to work where other people’s waistlines can increase in conjunction with mine), so that’s spotty. Also, I really don’t change up recipes all that much because that’s not why I got into baking, so posting recipes isn’t really appropriate. I also have more crafts that I dabble in…probably more than is really “healthy” in that I don’t seem to spend much time on them (see: the video games stuff above). Sewing, crochet, yarn spinning, cross-stitch, calligraphy, coloring, drawing, etc. I’d like to do more pottery, maybe learn woodworking, etc. But, the one craft I’ve been keeping up with the most for years? Knitting. My mother taught me to knit (and crochet) when I was in middle or high school, but I never really picked it up until university (which was mostly crochet) and then after graduation. I’ve put down my crochet hook for the most part, though I still do some from time to time. Knitting is more my thing, though. For a long time, I was a starter and not a finisher. Then, I found a designer that I liked, Laura Nelkin, and I started paying attention when she posted about knit alongs (KAL) and mystery knit alongs (MKAL). I did a couple and I had fun, learned new things, and, most importantly, finished projects. Then, she started a KAL club. It was mostly a MKAL club, so I was wary, but I’d liked the previous ones I’d done so I trusted her to not steer us wrong. I did it for 2 years. There were 4 patterns per year and she’d mail out kits. That helped me a lot because I get a lot of decision paralysis if there are too many things to choose from. The MKALs were my favorite because the clues would come out every 1-2 weeks and I had sort of a mini-deadline that wasn’t too time intensive. Sometimes it was miles of knit stitches, but usually it was at least interesting, if a bit repetitive. Doing those patterns seems to have kicked me into a better mindset to finish things. Of course, I also have a Ravelry queue of things I’d like to knit a bajillion items long. ;) I opted not to do the club this year, partly because I felt like I was only doing those patterns and not doing other things. The queue helps me focus, in a way, because now I am more compelled to work off the queue and not just do random things that may or may not get finished. Also? I don’t impulse buy yarn nearly as much as I used to. I had so much yarn that was just “WTF did I buy this?” in my stash. I still do, but not as much since I’ve de-stashed a bit. I try to have discrete projects in mind when I buy yarn, now, or I buy yarn specifically for a project. Now, of course, I just have to do them. I am pretty proud of how many items are complete, though. My Ravelry projects page may not look like much (you have to be a member to see the full list), but it’s a far sight better than it used to be. The only real “problem” I have, though, is that I would rather knit something but not actually wear it. Crazy, I know! I guess I’m more of a maker than a user? I’ve gifted a few things I’ve made to other people, but I’m slowly learning how to incorporate some of them into my wardrobe. So, apparently, when I say I’m going to blog regularly, I mean approximately once a year. I’ve been thinking about a couple topics, though, so I’ll likely be adding some actual content. I keep meaning to chronicle, to some extent, some of my knitting projects. And then I get these grand ideas and abandon them as too much work in addition to the actual knitting. I’ll have to work on that. My friend Elise wrote about waffles the other day, linking to my site because we are Waffle Sisters (and Gelato Sisters, Typewriter Sisters…basically, we’re sisters), and I realized I haven’t posted here in a very long time. Whoops. Back in my younger years, we had this great waffle maker made by Black & Decker. I have vivid memories of that waffle maker, including the little rectangular indicator light. Fast-forward to now and everything seems to be Belgian waffles. I don’t have anything against Belgian waffles, per se, but I still prefer the regular, shallow waffles. I’d had my eye on this waffle maker for a while and finally bought it at the end of February (after much waffle conversation with Elise, of course). It’s basically the same kind as the one from my childhood, but newer. There are some differences, some which may just be due to the way it’s manufactured now and some that might be me mis-remembering the waffle maker in the first place. The metal is way more shiny than I remember it, but maybe that was due to it losing its luster over time? The unit seems lighter, too, but maybe because as a wee one, everything was heavier. In any case, the best feature is the fact that the plates come off and can be washed in the sink. I don’t really care that the plates can flip over to be a griddle, although I have tried the device as a quesadilla maker and it works just fine for that, too. For traditional waffles, I’ve tried one recipe (essential raised waffles) and one mix (generic Krusteaz), and both work well. My raised waffles didn’t raise very much, which was partially expected (and mentioned in the recipe), but had a nice flavor, if you like your waffles yeast-y. The mix is what I expected and I have no issue continuing to use it. Both waffles crisp up well, freeze well, and re-heat well (at least in a toaster oven). On the savory side, I’ve made savory cornmeal waffles (#4 in this list). Those were pretty tasty, too, and the cornmeal adds extra crunchiness to the waffles. So, where do chocolate waffles come in? Not that there really needs to be a reason, but it all stemmed from ice cream. We bought ice cream sandwiches the other day and RJ, my other half, was miffed that they were so small. I was mock indignant one night when he ate two of them and we started calling it the queen sized ice cream sandwich and that he really wanted a California king sized ice cream sandwich, as if they were like mattresses. That got me thinking, what would be one way to make a “naturally” large ice cream sandwich? Waffles! Namely, chocolate waffles! I did a brief search for chocolate waffle recipes and settled on this one from Alton Brown and made them this morning. The verdict? They’re okay. They aren’t terribly chocolate flavored, to be honest. Most of the chocolate flavor comes from the chocolate chips. This could be my issue, though, as I’m still getting over a cold and my ability to smell and taste were offline for a couple days (incidentally, it’s incredibly difficult to feel satisfied after a meal when you can’t actually taste it) and it seems to be mostly back, but maybe not. I do like that the recipe has weight measurements – I prefer to measure by weight if at all possible. I used Ghirardelli cocoa powder since that was on hand. I’m not sure if it was very “fresh,” so that could have added to the flavor issue, too. 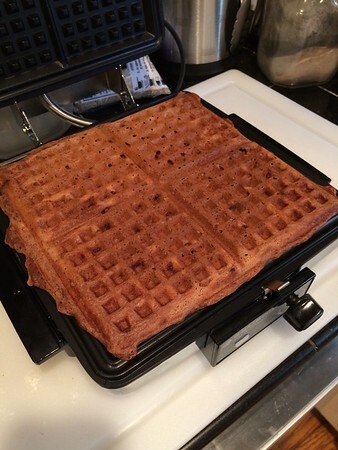 The batter doesn’t really spread, which isn’t a surprise, until you put the waffle maker lid down. It browns up nicely, though. 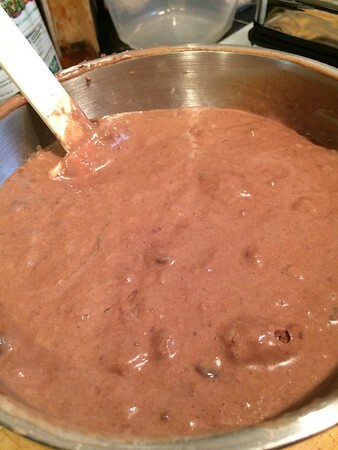 I think if I make this again, I’d use a darker cocoa. A Dutch-process might work (and may add a slightly different flavor), or perhaps a black cocoa to get the aesthetic needed for ice cream sandwiches. The third batch puffed up a great deal and overflowed the waffle maker, so I’m not sure how crispy that will end up being. The real proof will be whether or not sandwiching some vanilla ice cream between two chocolate waffles will achieve the desired large ice cream sandwich effect, but I’m not terribly hopeful unless the chocolate flavor somehow comes out more. I’m a bit embarrassed that I managed to blog for, like, a month in 2012. Ah, well, I’ve always had an odd relationship with blogging. The spam comments have died down quite a bit, though, so we’ll see how long that lasts as I attempt to start up again. 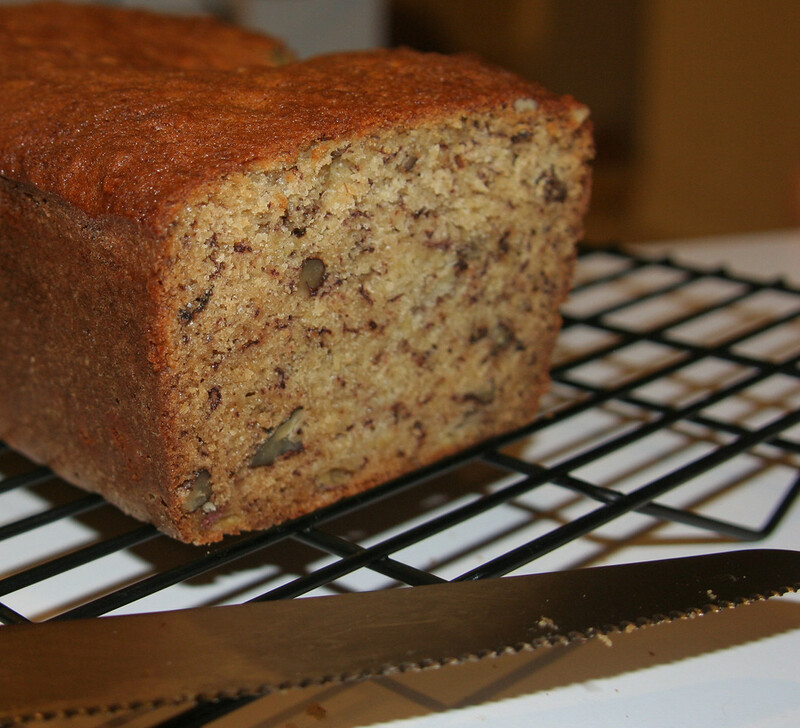 Other than making progress on the baking cookbook challenge, I did do some other baking in October. Here’s a quick roundup. Featuring: kale chips, Oreo stuffed chocolate chip cookies, lemon poppy seed bread, and bacon and egg muffins. It didn’t take long for the spam comments to start. >_> I’ve enabled a math captcha. Yay, maf! Ahh, bananas, such a fickle food. They start out green, seem to take forever to get ripe and yellow, and then go brown in a blink of an eye. I always buy a bunch with the hopes that I’ll eat one a day or something. It never seems to work out. Thus begins the cookbook challenge. The first is a Banana-Nut Bread, the second is for Banana-Walnut Muffins. The recipes are nearly identical. Yeah, not really sure why there’s a difference. 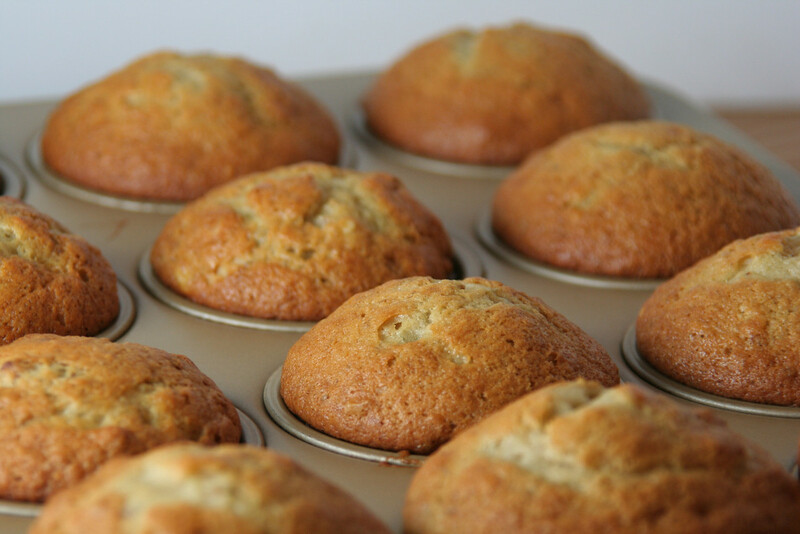 The loaf has a bit more spice and the muffins are a little more liquid. I didn’t have any buttermilk on hand, and I hate buying it because I can’t ever buy it in the exact quantity I need. I did, however, have buttermilk powder, so I used that. 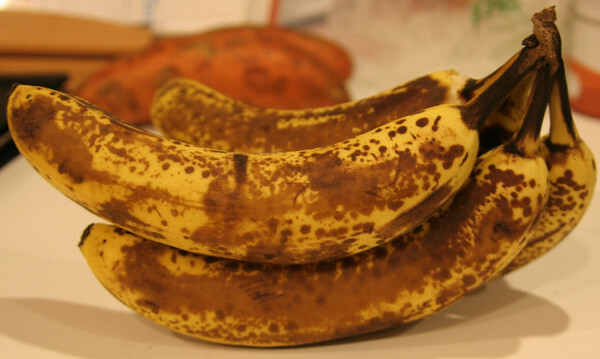 In any case, both recipes called for 2-3 very ripe bananas. Given I had 5, I used 2.5 per recipe. Sausage balls. Heart attack in ball form. Comfort food. 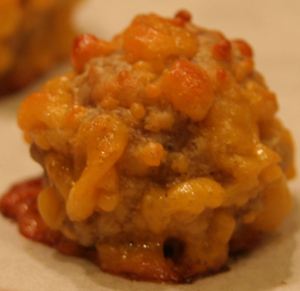 My mother used to make sausage balls when I was a kid growing up in Oklahoma. We…didn’t eat the best in those days. I recall many meals that involved spam and ramen. ;) Anyway. Sausage balls. So tasty, but so bad for you. I only make these a couple times a year, if that. At work, we’ve taken to using “Sausage Balls!” as a sort of expletive. We’re weird like that. You can find many recipes out there, but the gist of it looks like this. I have a lot of cookbooks, but I still almost always look online for recipes first. So, I decided I should really use my cookbooks. Make everything in the book. If I can count correctly, there are 39 recipes for Cookies & Bars; 45 recipes for Muffins & Quick Breads; 19 recipes for Coffee Cakes, Scones & Biscuits; 46 recipes for Cakes & Tortes; 44 recipes for Pies & Tarts; 22 recipes for Yeasted Breads; 20 recipes for Fruit Desserts; and 15 recipes for Custards & Egg Dishes. That’s a total of 250 recipes. Yeesh. We’ll see how much I have to modify. I’m not going to buy any special pans if I can help it – I have enough of those already. I might have to substitute some ingredients if there are any that use ingredients I really don’t like.